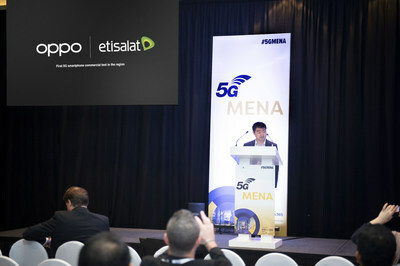 DUBAI, UAE, April 10, 2019 /PRNewswire/ -- As a pioneer in 5G technology, OPPO connected with regional telecom service providers, regulators, and global ICT solution providers to accelerate the commercialization of 5G enabled smartphones at the 5G MENA 2019 summit held in Dubai from April 7-9, 2019. 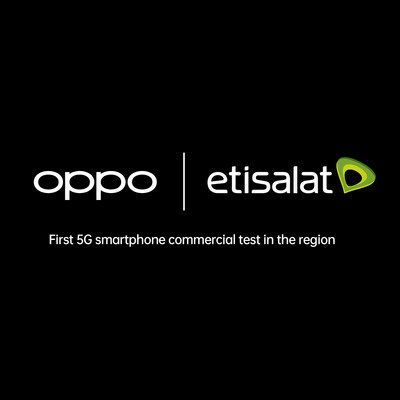 To further its commitment of developing the 5G ecosystem, the leading global smartphone brand also announced collaboration with Etisalat to test the compatibility of OPPO 5G smartphones with Etisalat's 5G network to ensure that user experience reaches the level for commercial use. This is the first 5G smartphone test between carrier and smartphone in GCC region. "This year is the first of 5G commercialization and is set to be a game-changer that revolutionizes the smartphone industry," adds Shi. "At OPPO, we have always focused on the user experience and know that today's consumers expect their smartphone to leverage 5G to bring about more immersive, seamless and intuitive digital services." "Our management's strategy to focus on digital innovation and to 'Drive the digital future to empower societies' have led to investments in superior and state-of-the-art technology solutions on the network. With continuous investments in technology and innovation on the network, Etisalat's infrastructure can enable 5G connectivity today for all fixed and mobile devices expected to be launched in the first half of this year," added Elkhouly. The company recently launched its "5G Landing Project" with several operator partners to accelerate the commercialization of 5G products and services worldwide. Last month, OPPO also announced that its first 5G smartphone has successfully passed 5G CE tests conducted by Sporton International Inc., making it compliant with EU requirements in areas such as wireless, electromagnetic compatibility, health and safety. OPPO formed a 5G standardization team as early as 2015 to focus on the research and development of 5G standards. To date, OPPO has obtained more than 1,000 global patents related to 5G technology, and partnered with industry heavyweights such as chipmaker Qualcomm on their "5G Pioneer" initiative.